Oliver (middle) with other prize winners at the Intel International Science and Engineering Fair (ISEF) in the US. Is cleaning the windows of high-rise buildings your idea of a nightmare? Well it is for a lot of others, too. Cleaning such perilous windows is not just scary, it’s dangerous, and it’s also the inspiration for an award-winning invention by Australian student and budding engineer Oliver Nicholls. That’s right, 2018 BHP Billiton Foundation Science and Engineering Award winner Oliver Nicholls has taken home the top prize and $US75,000 as winner of the Gordon E. Moore Award at the Intel International Science and Engineering Fair (Intel ISEF) announced in Pittsburgh, Pennsylvania on Friday night. The 19-year-old from Barker College in Sydney secured the win with his fully-autonomous robotic window cleaner that is designed to reduce human injury and decrease the costs of window cleaning on medium rise commercial buildings. The small robotic device uses drones, motors and propellers to navigate building facades and clean windows using water and micro-fibre scrubbers. Australian students excelled at the international competition, with five of Australia’s 2018 BHP Billiton Foundation Science and Engineering Awards finalists securing a total of 11 major award wins against a field of over 1800 high school students from 75 countries. Our Education and Outreach Director, Mary Mulcahy, said it was another example of Australia’s great science being recognised on the global stage. “Australia is one of the best places in the world to start a career in science, technology, engineering and mathematics (STEM). By having our high school students winning international awards, we are further strengthening our international reputation as an innovative country,” Ms Mulcahy said. BHP Billiton Foundation Executive Director James Ensor said seeing Australian high school students winning at an international level would inspire others to pursue independent research projects. “Studying STEM topics fosters innovative thinking and problem solving abilities that will help to address sustainable development challenges,” Mr Ensor said. The BHP Billiton Foundation Science and Engineering Award finalists attended Intel ISEF as part of the BHP Billiton Foundation Science and Engineering Awards Australian delegation and STANSW’s Young Scientist delegation. 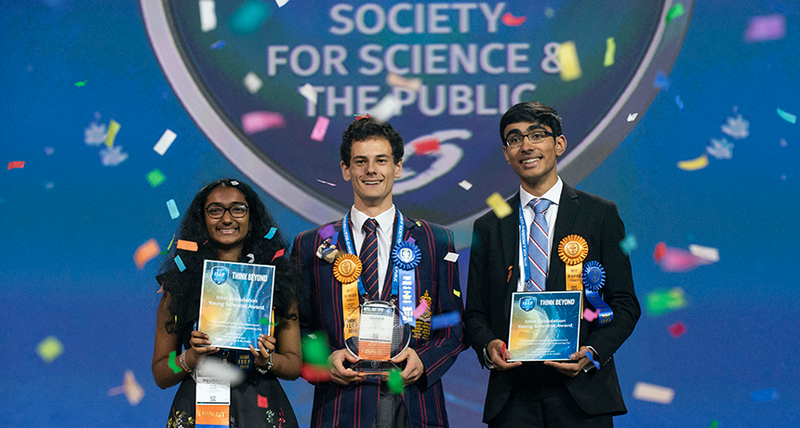 The Intel International Science and Engineering Fair (Intel ISEF), a program of Society for Science & the Public is the world’s largest international pre-college science competition. Each year over 1800 high school students from more than 75 countries, regions, and territories are awarded the opportunity to showcase their independent research and compete for on average $4 million in prizes. The BHP Billiton Foundation and Intel Foundation provide support for the BHP Billiton Foundation Science and Engineering Awards Australian delegation attending the fair. What are the BHP Billiton Foundation Science and Engineering Awards? So good. Is $75,000 enough to industrialise your great design? Come on C’wealth Government, show us the true worth of our smart youth by supporting their projects to fruition. Great idea!!! How is it possible to wash irreproachably a medium commercial window with a small piece of cloth? Oliver’s drone-like device uses motors and propellers to navigate building facades, and cleans windows using water that is sprayed through a powerful spray nozzle and micro-fibre scrubbers that rotate. As part of his project, Oliver put the product through rigorous prototyping, testing and evaluation to demonstrate its commercial viability, and a provisional patent has been issued. We’re excited to see what happens next! Brilliant! Well done young man!